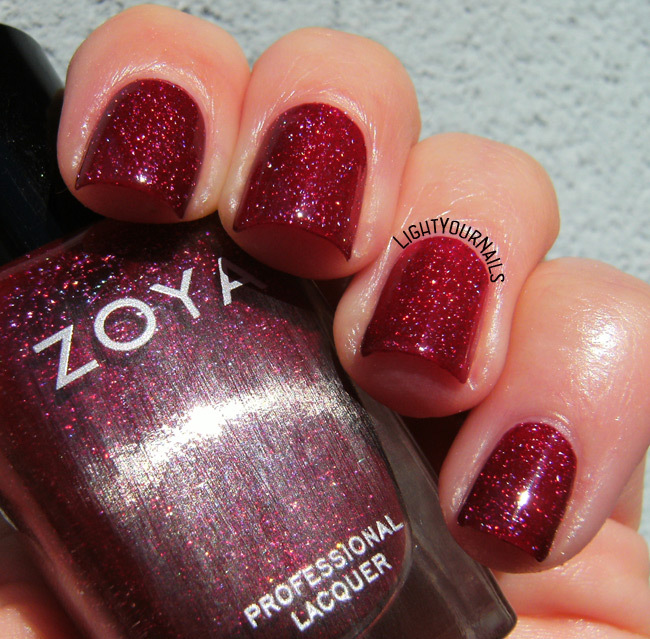 ABC challenge: Zoya Blaze | Light Your Nails! Last letter for ABC challenge and I went the easy way. 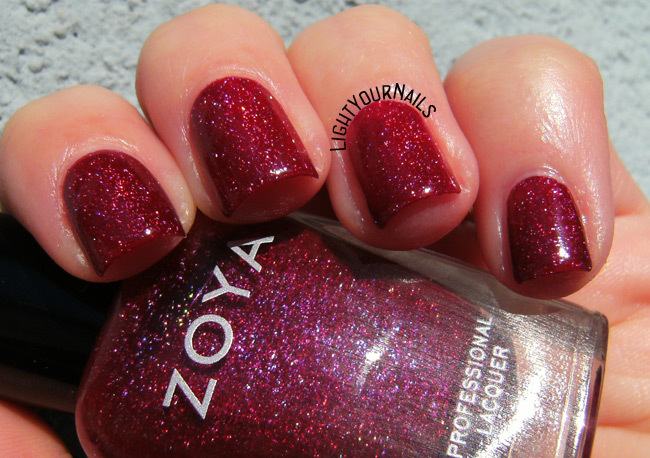 Zoya Blaze is a berry red jelly base filled with holographic flecks. It’s not very opaque, you’d probably need 3 coats to have an even coverage. I stopped at two and the colour was uneven, with some parts of the nail being darker or lighter. Application is very easy though. Siamo arrivati all’ultima lettera dell’alfabeto e ho scelto una Z quasi scontata. Zoya Blaze è un rosso dal sottotono freddo pieno di particelle olografiche. Non è molto coprente, e per avere un colore uniforme probabilmente servono tre passate. Io mi sono fermata a due, e avevo le unghie a chiazze chiare e scure. La stesura è molto semplice però. Zoya Blaze has been sitting in my stash for quite a while and I will be very unpopular saying it hasn’t wow-ed me. That’s also why I didn’t care adding a third coat to even out the colour. I just couldn’t love it. Ending the ABC challenge with something I didn’t really like is bittersweet to be honest, or maybe it’s just sad to be at the end. I will try to do a recap of all letters in the next few days so you can tell me what you liked best. 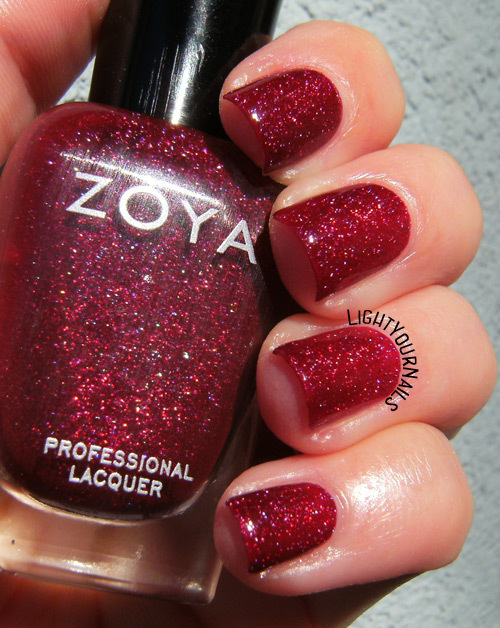 Until then care care and let me know what you think of Zoya Blaze! Possiedo Zoya Blaze da un po’ e sarò poco popolare dicendo che non mi ha lasciato a bocca aperta. E’ anche il motivo per cui non ho aggiunto una terza passata di smalto per uniformare il colore. Non è proprio scattata la scintilla. Finire la ABC challenge con qualcosa che non mi piace ha un sapore dolceamaro, o forse è solo la fine di qualcosa che da questa sensazione. Nei prossimi giorni cercherò di fare un post riassunto con tutte le mie scelte, così potrete dirmi cosa vi è piaciuto di più. Nel frattempo mi dite cosa ne pensate di Zoya Blaze? Too bad you didn't like Blaze. It is one of my favourite polishes, but it is jelly and needs thicker coats or more coats to get even colour. Anyhow, congrats on completing the challenge. One of my favorite Zoya polishes! Thank you for participating and I hope you will join next time too. Thank you Kristi! It helped with my untrieds for sure! Omg 😍😍😍 it's gorgeous jelly red. Yeah third coat job is tough for me too. But it's very pretty. Congrats on finishing the challenge! I really like Blaze, but I can see why it wouldn't be worth the trouble if it wasn't wowing you. Trovo questo colore davvero meraviglioso. Unico neo sono le tre passate che mi sembrano sempre troppe per uno smalto. Scocciano quasi sempre anche me! Che già è un peccato! Oh man, this is one stunning polish! Too bad you didn't like it much! Exactly what I'm feeling Jessica!! Gotta hate that. Blaze is one of my fave reds, the third coat definitely helps though. Thank you! I'm following your steps, too! It looks pretty, at the very least! Oh man, this is one of my favorite red polishes! Really? Why, oh why didn't it work for me? Too bad, I really like the idea of this polish, but it should be more opaque, for such an expensive brand! It still looks gorgeous on you, though. Yeah, don't let me think of the price haha! Blaze is one of my favorites - and I really wish Zoya would do more like it! It's always a bummer when a polish doesn't work like you want it to :( Still looks fantastic on you though! Formula itself was good, it just didn't work for me! Grazie del commento Milena. Come ho scritto nel riquadro non accetto link, scusa.